The Brake-Force is a styled Timing activated brake control with LED indicator that shows braking intensity. Control comes equipped with Tekonsha style plug giving you the ability to use your Tekonsha direct plugin harness. Compatible with Electric/Hydraulic trailer brakes. Intuitive, vertical slide matches the way a driver reaches for the control. Fully digital settings. Plugin connection allows for quick installation and removal. Can mount at any angle. Short proof protected. 1-4 trailer brake axles. Lifetime warranty. 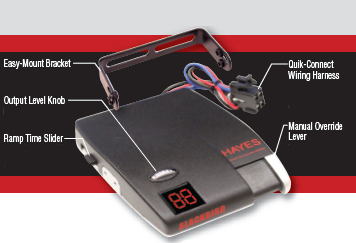 The Blackbird is a the ultimate in digital time-based trailer braking – giving you BIG power in the palm of your hand. The Blackbird operates seamlessly with electric and electric-over hydraulic braking systems and does not interfere with anti-lock brakes, cruise control, or other electrical systems on your vehicle. Control features Easy-Mount Bracket, Output Level Knob, Ramp Time Slider, Quick-Connect Wiring Harness, and Manual Override Lever. Supports 2,4,6 or 8 brake trailers. No leveling required. Reverse wire protection. Operates seamlessly with electric over hydraulic braking systems. F.E.T. (Field Effect Transistor) Technology. Comprehensive diagnostic error codes. Does not interfere with anti-lock brakes, cruise control or other vehicle electrical systems. Limited lifetime warranty. Includes installation instructions and all attachment hardware (direct plugin harness sold separately). The Engage is a digital time based controller and is the top of the line time based brake controller. This controller is equipped with a digital display allowing you to select adjustable voltage and power ramp up times. Comes with standard metal mounting bracket, pocket sleeve as shown is sold separately. The Syncronizer modulates and controls current from the battery to the trailer brakes. The longer the brake pedal is depressed the greater the current delivered to the trailer brakes until the preset brake power setting is reached. Comes with standard metal mounting bracket. The Impulse is a styled Timing activated brake control with digital display. Control comes equipped with Tekonsha style plug giving you the ability to use your Tekonsha direct plugin harness. Compatible with Electric/Hydraulic trailer brakes. Intuitive, vertical slide matches the way a driver reaches for the control. Fully digital settings. Percentage of braking power shown in a digital L.E.D. display. Plugin connection allows for quick installation and removal. Can mount at any angle. Short proof protected. 1-3 trailer brake axles. Lifetime warranty.